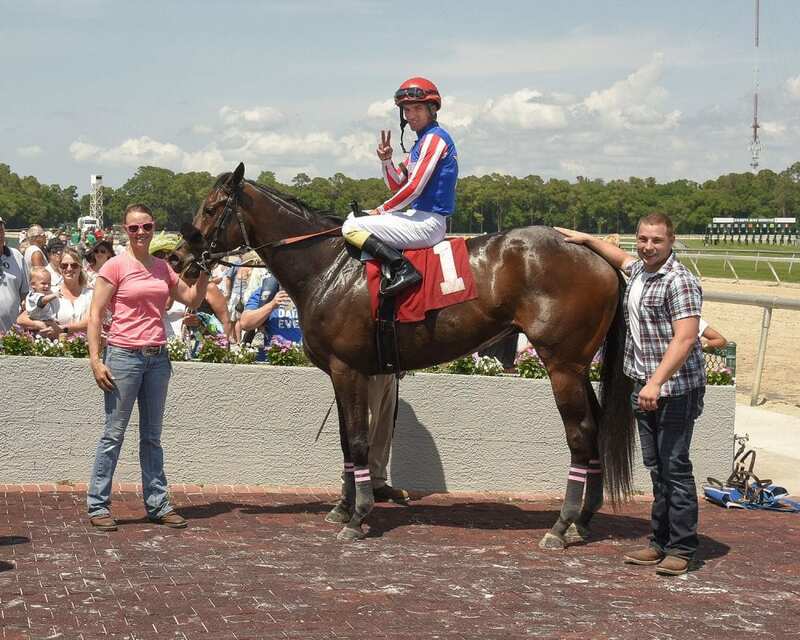 Tyler Rotstein was trying to keep his emotions under control after his 4-year-old gelding Togie won Saturday's fifth race at Tampa Bay Downs, the 23-year-old trainer's first career victory in only three tries. “It's probably the most thrilling experience I've had in a long, long time,” said Rotstein, a former strong safety-linebacker for the Bluffton (Ohio) University football team. You know who could relate? Lee Cameron, a 50-year-old long-time exercise rider from Duck Lake, Saskatchewan, who saddled his first lifetime winner in the sixth race on the turf from his fourth lifetime starter, 7-year-old mare Ordinary Love. No one could remember the last time trainers sent out their first career winners in back-to-back races at Tampa Bay Downs, but Togie and Ordinary Love created memories that will be cherished by their conditioners for a long time. Cameron had purchased Ordinary Love privately from Constance Foley after he trained the mare to a second-place finish by a neck here on Feb. 16. Gary Boulanger, who Cameron has known from their formative years at bush tracks in western Canada, was again aboard today to reward Cameron with his milestone triumph. “I'm kind of still floating,” Cameron said about a half-hour after the race. He has always wanted to train horses, but raising his two daughters with his wife Anita, a foreperson for Casse, has always been his No. 1 priority. “Now that they have graduated from high school and are on their own, I'm pursuing my lifelong ambition,” said Cameron, who saw Ordinary Love leave his barn after today's victory when she was claimed by trainer Peter Wasiluk, Jr., for new owner Bull O' The Woods Stables for $16,000. Cameron's lone remaining horse is 8-year-old gelding Awesome Sky, who last raced at Churchill Downs in 2015. “I'm open for business,” he said. Walber Alencar rode Togie, who is owned by Scott and Frank Racing. Alencar had ridden Rotstein's 7-year-old gelding Great Plan to a second-place finish in today's first race before breaking through in the fifth. Besides praising Alencar, Rotstein thanked his exercise rider, Tehfeh Haynes. “She's done a tremendous job with this horse and I don't know if I would have seen this happen if she hadn't been on him,” he said. Rotstein, whose father is a Thoroughbred owner, is unsure if training is in his future, even though he loves the sport. An assistant to Butch Marshall at Thistledown in Ohio the last several years after starting out as a hotwalker, he recently took his Law School Admission Test and will receive the results this month. “If all goes well, I'll be in law school this fall, which is crazy because my dad told me that if I won a couple of races, I was going to have the bug and it would be hard to stop training,” said Rotstein, who keeps five horses at Classic Mile in Ocala. “I wouldn't say (law school) is my preference. … but that's the plan. “If I could play college football again and train racehorses, I'd be the happiest person in the world,” he said. “I've always been a competitive person, and this is one way I can still be competitive. I love the athleticism of these horses, their beauty. My favorite time is when I'm at the barn by myself late in the afternoon topping off their water and it's just me and the horses. Cameron can't advise Rotstein on a career path, but he did offer a suggestion should the youngster decide to stay in racing. Togie and Ordinary Love spoke volumes today. This entry was posted in People and tagged first win, gary boulanger, Horse Racing, lee cameron, tampa, tampa bay, tampa bay downs, trainer, tyler rotstein, walber alencar by Press Release. Bookmark the permalink.